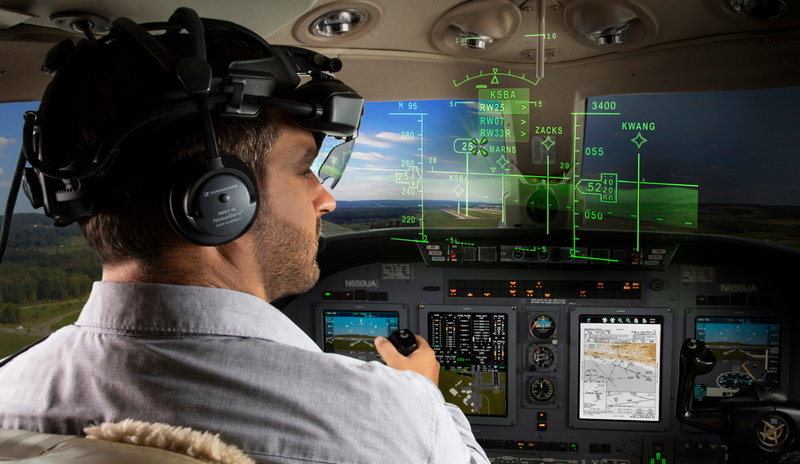 Universal Avionics (UA), a subsidiary of Elbit Systems, unveiled a new ‘Head-Up, Head-Down’ flight deck system at NBAA-BACE 2018 yesterday. The new system is based on the integration of the InSight Display System and the SkyLens wearable Head-Up Display. The new key functionality of this unique integration offers the ability to control the Flight Management System (FMS) and flight deck with the pilot’s sight, using the “point and click” capability. This allows the pilot to program and update flight path, runway selected and other essential FMS commands during critical approach phases, without distracting attention from flying the aircraft head-up. The fully integrated function allows change of runway selected, approach selected and waypoint programing, all by looking on a virtually presented flight path and point selection with sight. See latest HD Video Interviews, Podcasts and other news regarding: Elbit Systems, Universal Avionics.